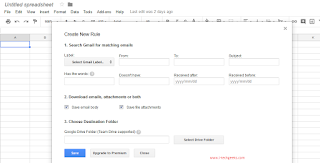 Tech articles: How to Save Gmail Email in Google Drive? Worried about losing your precious data, attachments and emails? You no longer need to face this terrifying situation. You can now backup all your emails from Gmail to Google Drive. All you need to do is configuring your email client to automatically take backups on Google Drive. Let us learn how to save Gmail email in Google Drive. Earlier on, you could save an email from Gmail in your Google drive as a Google Document. However, now you have the option to save your emails as PDF in Google Drive. The following instructions will help you learn to setup the Google Script for your Gmail account. 1. You need to download an add-on in your Google drive called the Save Emails as PDF. Go to Google drive. In google drive under New or My drive open google sheets. In Google sheets in the menu click Add ons --> Get Addons. In the search box type save email and download "Save email and Attachments"
2. Now, in the Add-on menu you need to go to Save Emails, Create New rule and select a Gmail folder from the drop-down menu you can see. 3. This Google script is an open-source script. Do not worry, as it will never share any data with anyone. 4. You will need to select a folder in your Google Drive and create this rule. This will lead to the sheet automatically saving your messages as PDF within an hour. 5. Alternately, you could go to Saves Email – Manage Rules and instantly download any Gmail message as a PDF on Google Drive. Those who wish to save their Gmail emails along with the attachments need to opt for the premium edition of Save Gmail to Google Drive. It has many features that includes maintaining the flow of conversations in the PDF document of a particular email. 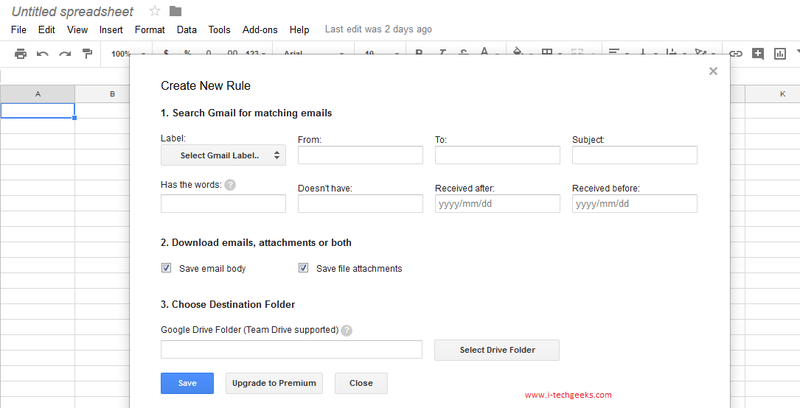 This is how you save Gmail email in Google Drive. The best part is you don’t just need Google Chrome or a mobile app to help you save your emails on Google Drive. You can do it from anywhere by just applying the label PDF to the email. The Google Script will do all the work for you.